Did you know? An astronomical unit (au) is the average distance between the Earth and sun, about 93 million miles or 149 million kilometers. 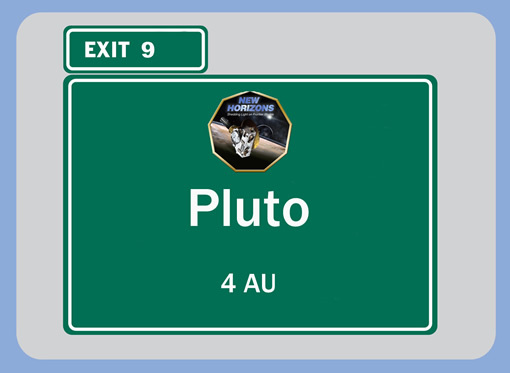 New Horizons' journey from Earth to Pluto will cover more than 32 au. New Horizons sailed past another milepost today when the NASA spacecraft moved to within four astronomical units (au) of Pluto – which is less than four times the distance between the Earth and the sun, or about 371 million miles (598 million kilometers). "We're as close to the Pluto system now as Earth ever gets to Jupiter, a first for any spacecraft,” says New Horizons Principal Investigator Alan Stern, of the Southwest Research Institute, Boulder, Colo. “And hold on to your hat, it just gets more and more exciting from here." Since launch on January 19, 2006, New Horizons has covered nearly 2.89 billion miles (4.62 billion kilometers). It makes a temporal connection with one NASA’s legendary deep-space explorers this summer when it crosses the orbit of Neptune on Aug. 25 — exactly 25 years after Voyager 2 made its historic flight past that giant planet. When New Horizons arrives at Pluto on July 14, 2015, it will have traveled farther than any spacecraft ever has to reconnoiter its prime target.